Retouch Family Photos – Enhance your family photos in advanced photo editing and retouching techniques. Photos will never change, even the person will change. Hence, people would like to save their photography memories forever. This will explain the history of their lives to the forthcoming generation. Due to environmental, lighting and other issues, sometimes your pictures may get damaged. Hence, contact best family photo retouching services to retouch family photos. 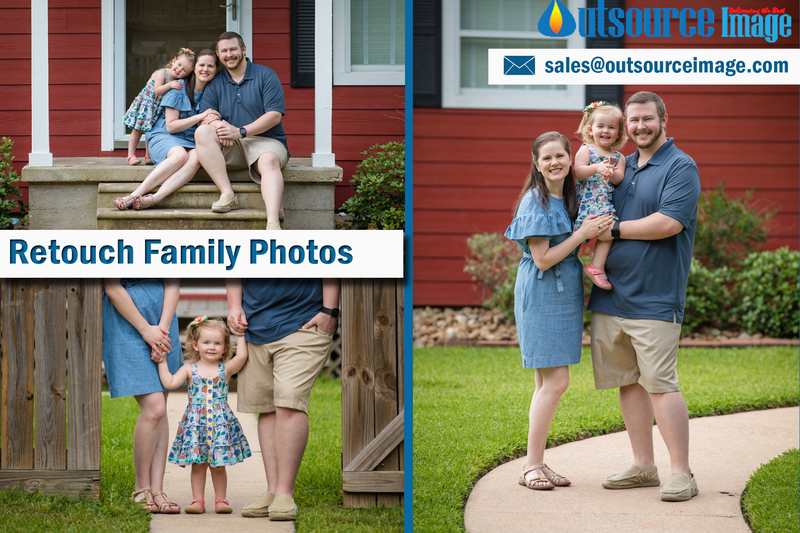 Professional Family Photo Editors – Retouch family photos with advanced family photography editing experts in Outsource Image. We are professional photo editing services provider across India, USA, Australia, UK, Canada, Philippines, Norway, Poland, Sweden and other Europe countries. Outsource family photo editing services and family photo retouching services to us and get retouched photos within few hours. Family portrait retouching to transform your ordinary photos into the extraordinary look. Photo retouching improves the quality of photographs; it looks more clear and attractive. Our family photo retouching services are skin smoothening, spot removing, wrinkles, dark circles removing, eyes retouching, ears retouching, and brightness and contrast adjustments. By using cutting-edge technologies, our photo editors can enhance your photography with basic, medium and advanced level image retouching techniques. Send 2 to 3 images to our family photo enhancement team and get your edited images back within 2 or 3 hours.